I’m really excited to finally share this project with you guys! I bought these skis way back in MARCH and they have been sitting in my garage the entire year, just waiting to be beautified! I gave a little sneak peak on Instagram, but now it is finally time for the full reveal! 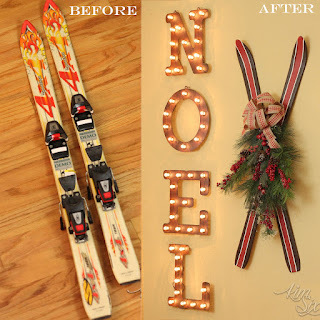 The minute I saw the original old skis at the thrift store I knew what I would do.. I had seen vintage skis for sale for big bucks (these ones for example are $300!) and I wanted that look for less. I didn’t want mine to be quite as rustic, and since my Christmas color scheme this year was red and brown, I decided to add more color. This year I added them to my living room, but they would also be really cute propped up by the front door or on the porch. The process was pretty simple.. next time you see a set of cheap skis, definitely snap them up! This pair cost $7, which is way less than that $300 price tag for the commercial ones. First I removed the hardware. If you wanted the skis to look like real skis, you could save it and put it back on. I threw it out since it made the skis heavy and I was going to cover that area up with greens anyhow. Once the brown was dry I used painters tape to create an accent stripe down the center. I used some leftover wall paint sample I had from my son’s bedroom makeover. I used roll vinyl and cut thin strips to make the accent stripe. You could use your Silhouette or Circut machine to cut the strips, or just paint them on, but I cut them by hand. Finally, I added a floral swag and a giant burlap bow. I just love how it looks.